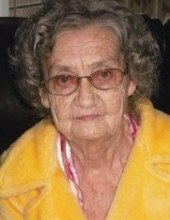 Hazel Marie Charles Ratliff, age 91, of Upper Chloe in Pikeville, Kentucky, Passed away at The Landmark Nursing Home in Elkhorn City, Kentucky Saturday March 16, 2019. Hazel was born February 9, 1928 at Zebulon, Kentucky the daughter of the late Earl and Cynthia Scott Charles. She was also preceded in death by her husband Cecil B. Ratliff, her son Cecil Blake Ratliff, and two sisters and eight brothers. Hazel worked in the dietary department at Pikeville Methodist Hospital and was a member of Cornerstone Christian Church. Mrs. Ratliff’s survivors include: two sons, James Earl (Judy) Ratliff of Millard, Pikeville, Kentucky, and Larry (Della) Ratliff of Pikeville, Kentucky, daughter-in-law Joyce Ratliff of Pikeville, Kentucky, one sister, Thelma Ann George of Romulus, Michigan, nine grandchildren, Kathy Howell, Angela Watts, Cindy Whetzel, Bret Ratliff, Larry Ratliff Jr., Edward Lee Ratliff, Mike Ratliff, Cecil Ratliff, and Melissa Burke, thirteen great grandchildren, and six great great grandchildren and two special nieces, Jettie Click and Aretha Hatfield. Hazel will be remembered and loved by her family and friends. To send flowers or a remembrance gift to the family of Hazel Marie Charles Ratliff, please visit our Tribute Store. "Email Address" would like to share the life celebration of Hazel Marie Charles Ratliff. Click on the "link" to go to share a favorite memory or leave a condolence message for the family.